In their short time of existence the Diggers of San Francisco had a profound impact upon the their immediate surroundings in San Francisco and on the American Counterculture as a whole. In the nineteen-sixties radicalism and resistance to cold war hegemony took many forms, from the lunch counter sit-ins to demonstrations that attempted to levitate the Pentagon. The Diggers arose as a part of, and in response to, the radical zeitgeist sweeping the nation. Popular perception and scholars of the American youth movement of the 1960s have divided it into the expressly political and earnest New Left and the apolitical and superfluous Counterculture. Drawing on the written records of the Diggers (their broadsheets, pamphlets, and manifestos), the memoirs of former members (in particular Emmett Grogan and Peter Coyote), as well as interviews and contemporary mediarecords, I will demonstrate the ways in which the Diggers problematize this distinction. Understood within the context of the growing community of Haight-Ashbury, the growing radicalization of young Americans, and a growing political theater movement the Diggers disrupt this categorization and reveal it to be a false dichotomy. As an expressly political street theater group the Diggers strove to make what some have described as the micropolitics of resistance, those everyday acts by which ordinary people resist the dominant culture, expressly political. 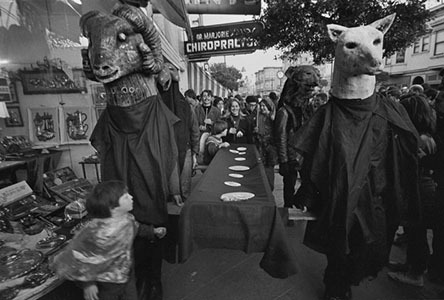 They sought to use the methodology and tools of experimental street theater to promote a revolutionary praxis. They attempted to transform daily life through the power of everyday acts. By acknowledging the power of average people they strove to harness individual acts, to teach people that they could act as if the world they imagined already existed, and through this enacting, they would create the condition they described. They sought to transform individuals into life actors– self conscious agents of social change.